Ernie Ellis does not have an exceptional story — he has not published a book or attained national or international fame. However, he is exceptional as a shining example of someone who is using their voice to better their own community. He has come up against a number of personal hardships, but, as his nominator puts it, the adversity he has faced has become his advocacy. The first of these hardships occurred when Ernie’s son died tragically at an early age. Ernie and his family found the strength to endure both this and Ernie’s own health emergency not too long after, a stroke which left him a hemiplegic. 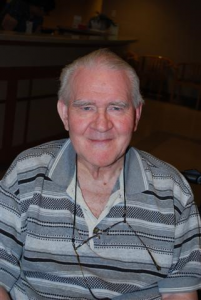 After much consideration between Ernie and his family, they made the major decision for Ernie to move permanently into one of Park Place Seniors Living’s care homes in Fort Langley, so he could receive the care he required. Moving into a care home is a big transition for any person as it marks a huge shift in routine and surroundings. Ernie was acutely aware of this, and once he became familiar with his new home, he made a point of welcoming each new person with his friendly and calming presence. He has become such a welcoming beacon that staff at the care home began to ask Ernie to make personal visits as each new person arrived. According to staff, the people who live at the care home have always been the driving force and epicentre of Park Place’s operational framework. Ernie has earnestly managed to ensure this happens. He became the Park Place resident representative for monthly meetings with the care homes’ Integrated Quality Management team across BC and Alberta. He even impressed Accreditation Canada’s survey team this past spring so much that they named him one of Park Place’s major strengths! The care home staff at Park Place call it a privilege to witness the resilience of people like Ernie: “he is the type of person who teaches, influences and motivates us in our ability to care for others”. Ernie has made meaningful contributions both to his local Fort Langley community and as someone who strongly advocates for other people living in long-term care, ensuring that their voices are heard loud and clear.